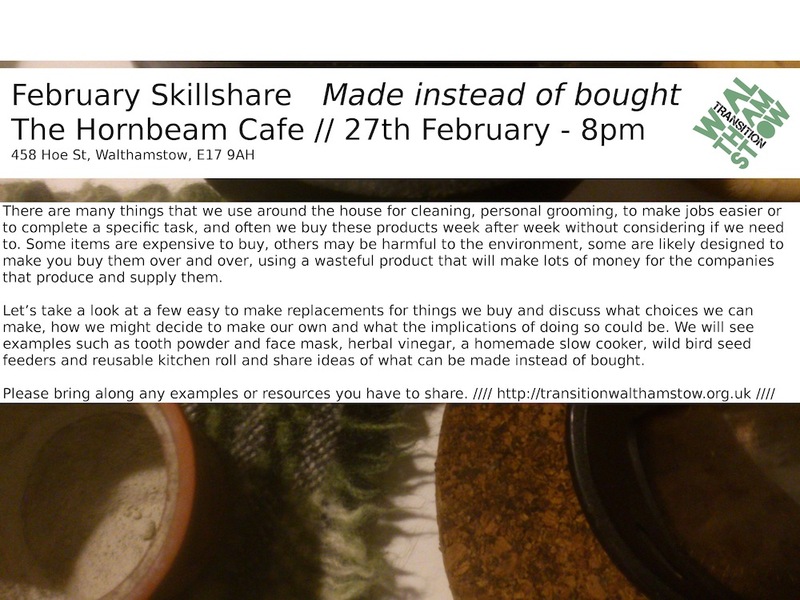 At this month’s skillshare at the Hornbeam Cafe, we will have a look at some commonly used household goods that can be made instead of bought. There are many things that we use around the house for cleaning, personal grooming, to make jobs easier or to complete a specific task, and often we buy these products week after week without considering if we need to. Some items are expensive to buy, others may be harmful to the environment, some are likely designed to make you buy them over and over, using a wasteful product that will make lots of money for the companies that produce and supply them. Let’s take a look at a few easy to make replacements for things we buy and discuss what choices we can make, how we might decide to make our own and what the implications of doing so could be. We will see examples such as tooth powder and face mask, herbal vinegar, a homemade slow cooker, wild bird seed feeders and reusable kitchen roll and share ideas of what can be made instead of bought. Please bring along any examples or resources you have to share.